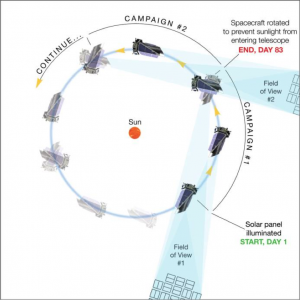 The K2 mission will observe sequential ecliptic campaigns with a duration of ∼83 days, where 75 days are dedicated to science. 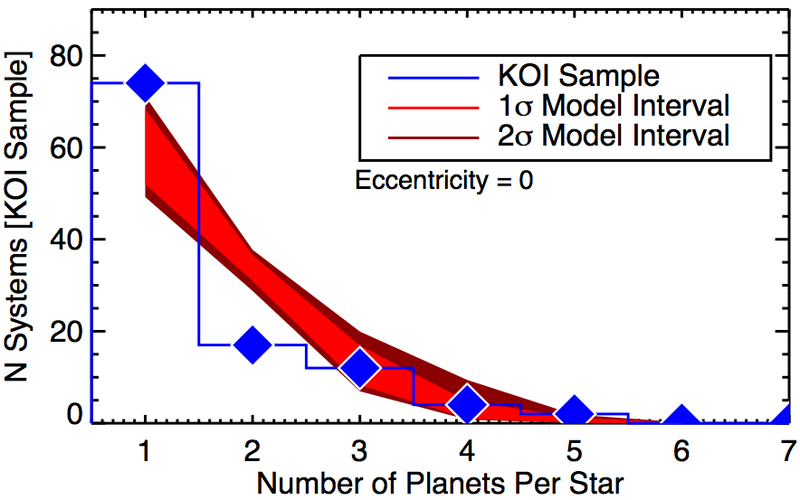 I’m a bit late to the game on this one, but I wanted to read Howell et al.’s (2014) paper describing the planned K2 mission, what is essentially the reincarnation of the Kepler mission. Launched in 2009, the Kepler spacecraft was happily staring at about 150,000 target stars over about 4 years, looking for the shadows of planets as they passed between the Earth and their host star (called planetary transits). Groups using Kepler data have found thousands of planets outside our solar system, revolutionizing exoplanet studies. Unfortunately, two of the reaction wheels used to keep the spacecraft pointing stably at its target field failed by May 2013, ending the nominal science mission. 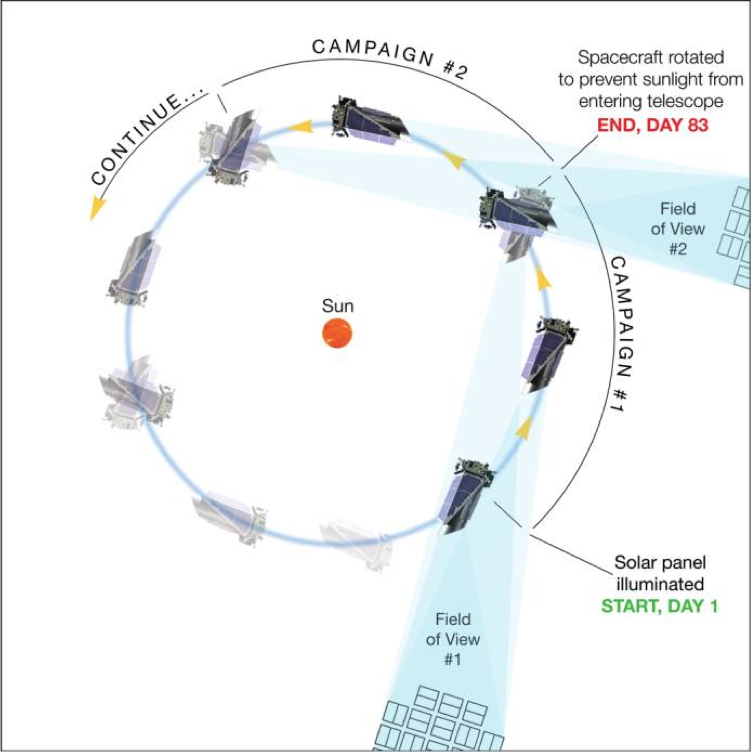 However, by carefully angling the telescope (see figure at left) and keeping it pointed along its orbital plane, NASA engineers realized they could use the photon pressure from Sun as a sort of third reaction wheel, allowing the astronomical revolution to continue — thus was born the K2 mission, which NASA selected for funding May this year. 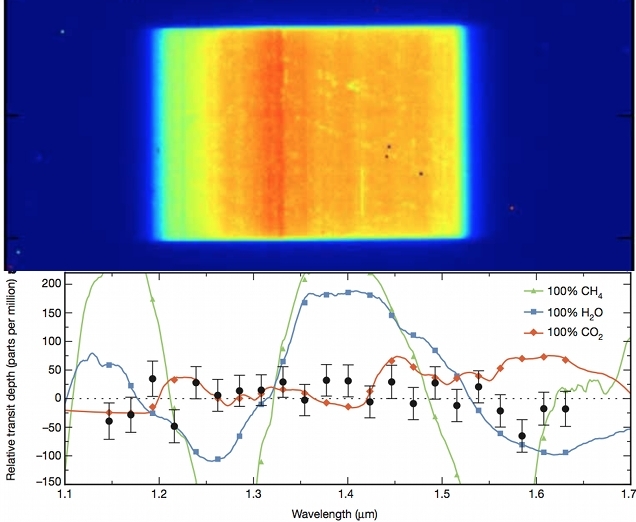 The paper from Howell et al. (2014) describes the scientific and engineering capabilities of the K2 mission, which closely match those of the Kepler mission. So a lot of what Kepler could do, K2 can, too. In fact, since mission engineers have to turn the spacecraft every 80 days to satisfy the pointing requirements, K2 will look at lots of different fields on the sky, in contrast to Kepler, which only stared at the same field. This variable pointing will enable a wider variety of scientific investigations, as discussed by Howell et al., including looking for more transiting planets, but also studies of other galaxies, supernovae, stellar clusters, and more. In fact, the astronomical community submitted more than 100 different ideas of things to do with K2. So the scientists and engineers at NASA have really done a spectacular job salvaging what otherwise would have been a disappointing loss. Artist’s conception of a habitable exoplanet in orbit around its red dwarf star. Credit: NASA Ames/SETI Institute/JPL-Caltech. 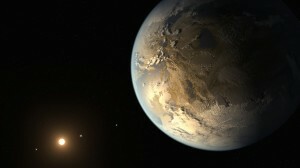 From http://themeridianijournal.com/2014/04/big-discovery-first-earth-sized-exoplanet-habitable-zone-another-star/#more-5509. 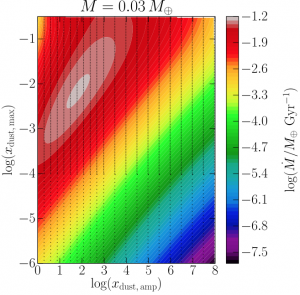 Interesting paper from Prof. Michael Jura at UCLA and colleagues, in which they look for the chemical signatures of plate tectonics in white dwarfs that are accreting planetary and asteroidal material. The paper presents a really neat idea, combining several big concepts. First, there is strong evidence that several white dwarfs (the ghostly remnants of Sun-like stars) are accreting rocky materials. The atmospheres of white dwarfs are very simple, hot hydrogen and helium cooling to space over billions of years. Any other, heavier elements quickly settle out of the atmospheres (on timescales of millions of years), and so if you find such, heavier elements in the atmospheres (via spectroscopy), those elements were probably recently dumped into the atmosphere — a process called pollution. Such pollution has been observed for many white dwarfs, and the pollution typically consists of rocky elements, silicon, magnesium, etc. Consequently, the polluting materials probably come from rocky asteroids, falling into the white dwarfs. Jura and colleagues point out that some of the pollution may arise from the crusts of extrasolar rocky planets orbiting the white dwarfs, in the form of debris from large impacts with the planetary surfaces. Second, on the Earth, the constant subduction and eruption of crustal materials from plate tectonics has the effect of sieving out certain elements and leaving them in the crust, producing a crustal composition distinct from that of other planets and asteroids. 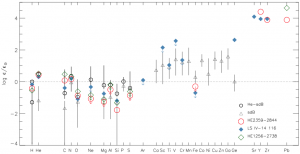 Jura and colleagues went looking for such a chemical signature in the rocky pollution of white dwarfs but unfortunately don’t find it. 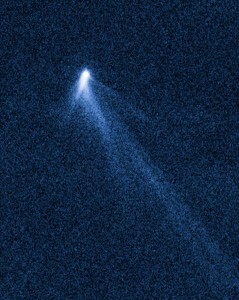 However, this initial study may provide a novel to search for the signs of plate tectonics in other planetary systems. That’s important because plate tectonics is thought to be a key requirement for making a planet suitable for life, but observing it astronomically is almost impossible (there’s no strong evidence any solar system planets other than Earth experienced/s plate tectonics). Jura and colleagues may have provided us a new way to peer into the geophysical histories of extrasolar planets. Predicted fatality counts. MFI indicates masculinity-femininity index (1 -> very masculine name, 11 -> very feminine name), and hurricanes with low MFI (vs. high MFI) are masculine-named (vs. feminine- named). Predicted counts of deaths were estimated separately for each value of MFI of hurricanes, holding minimum pressure at its mean (964.90 mb). We discussed a very interesting paper today in Journal Club, Jung et al.’s (2014) study of correlations between the perceived masculinity-femininity of a hurricane’s name and its death toll. As reflected in the figure at left from the paper, the higher the masculine-feminine index for a hurricane (MFI, 1 -> very masculine name, 11 -> very feminine name), the larger the predicted fatality count. As a specific example, Jung et al. estimated that Hurricane Eloise (with a decidedly female MFI = 8.944) killed three times as many people as Hurricane Charley (MFI = 2.889). Jung et al. also polled participants and found they consistently rated female storms as less likely to be severe and indicated they were less likely to evacuate in the wake of female storms, perhaps due to implicit gender biases. Ostensibly, their results suggest a lot of lives could be saved by simply not using female names for hurricanes. But there are a lot of questions that were not addressed by the study, and others who have looked at the data have pointed out important unresolved issues. A blog entry at Prooffreader.com pointed out that the authors should only have considered hurricanes after 1979 since there were no male hurricane before then. 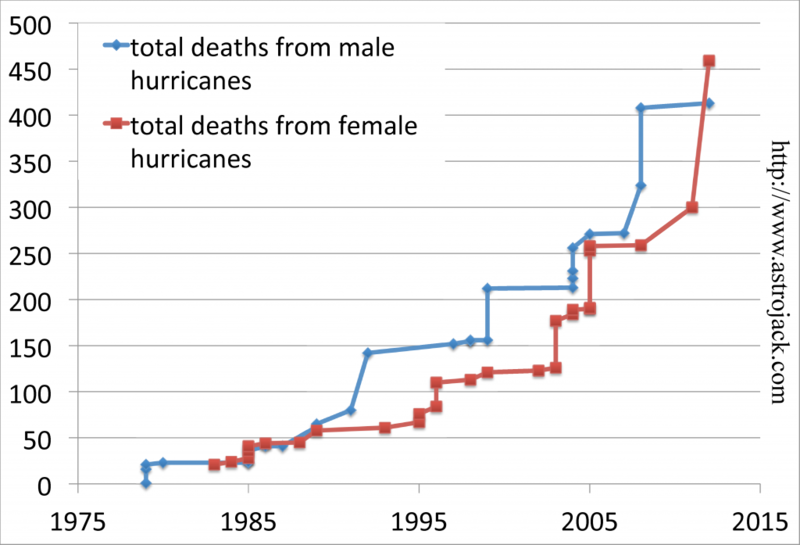 The blogger showed that, comparing total hurricane deaths since both male and female names have been used (1979), male hurricanes killed more people (413 total) until just two years ago, when Hurricane Sandy brought the total for females to 459. And this result used the authors’ own data. The plot at right is a recreation of the Prooffreader.com plot. I spent several hours yesterday, poring over the paper and have to admit that I did not understand the statistical methods employed. The authors don’t give a lot of details, and the key references for the techniques seem to be two textbooks to which I don’t have access. The paper talks about using a model to estimate the number of deaths for a storm of a given severity, but to the extent that I can compare their predicted death tolls to actual, the model seems pretty discrepant with the data. For example, their model estimates that Hurricane Eloise killed 41.45, but the actual number killed was 21. They also estimated Hurricane Charley killed 14.87, whereas Hurricane Charley from 1986 killed 5 and the one from 2004 killed 10 (they don’t say which Charley they meant). So Jung et al. present a very interesting idea, but it’s not at all clear that their results hold up. I’m sure this paper will prompt a spat of sociological studies into hurricane statistics, though, which will probably lead to additional disaster preparedness and save lives. Figures from Kreidberg et al. (2014). The top panel is an image of the Hubble Telescope CCD as it collected photons of many colors passing through GJ 1214 b’s atmosphere. 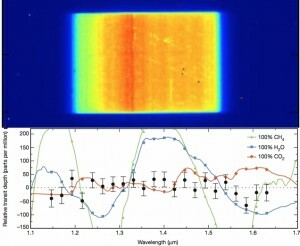 The bottom panel shows the infrared spectra that results from analysis of that image, showing no molecular features. The year starts with a spectacular result from Laura Kreidberg and colleagues: the super-Earth exoplanet GJ 1214 b has high altitude clouds in its atmosphere. 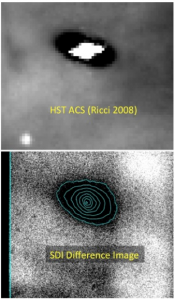 The image at left shows observations from the Hubble Space Telescope. These data were collected as the planet GJ 1214 b passed in front of (transited) its host star. When that happens, light emitted by the host star passes through the planet’s atmosphere, and the atmosphere can imprint a spectral signature on that light, telling us what it’s made of. 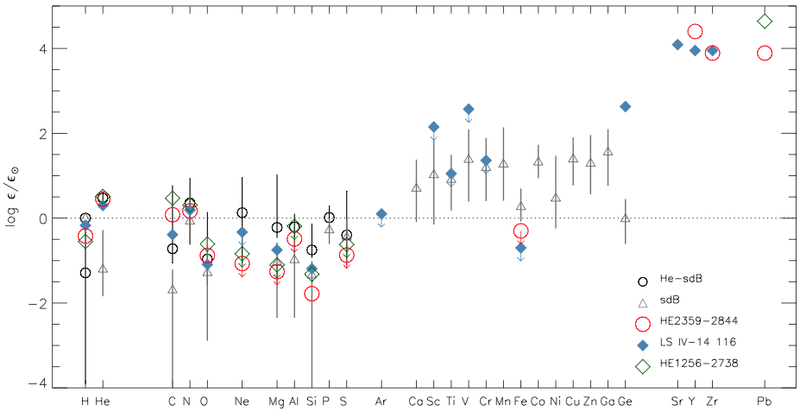 But for GJ 1214 b, as shown by the bottom at left, there were NO spectral signatures — the spectrum is completely flat. The most likely explanation is that the planet has clouds high in its atmosphere that block the star light from passing through the part of the atmosphere where spectral signatures would be imprinted. To make such a flat spectrum, GJ 1214 b’s clouds have to be very high in its atmosphere. 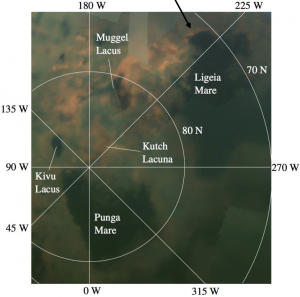 Kreidberg and colleagues estimate the cloud deck can’t be lower than about 1 millibar in pressure. On the Earth, cirrus clouds, some of the highest clouds, live at pressures of about 300 millibars or 10 km in altitude. Earth’s atmospheric pressure doesn’t drop to 1 millibar until an altitude of about 70 km, above a height where meteors typically burn up. So GJ 1214 b’s clouds are very unusual.